Evolution: Scientific Fact or Scientific Fiction? 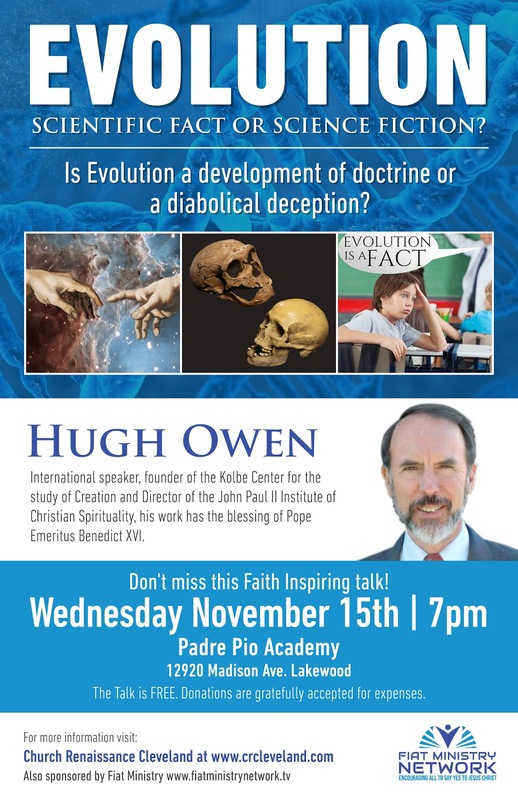 On Wednesday, Nov 15, 2017, Padre Pio Academy in Lakewood, Ohio, will host a faith inspiring talk by Hugh Owen, founder of the Kolbe Center for the study of Creation. The talk is free but donations will be welcomed. Please consider attending this and bring a friend! The more and better you know the Truth, the better your Lex Vivendi. Also, there will be a Traditional Latin Low Mass at 6pm, celebrated by Fr Wessel. Here's the schedule for the Sanctum Catholicam Conference at St Sebastian in Akron on OCTOBER 14, 2017. Thanks to a Friend for pointing out that the reminder post for the Sanctum Catholicam Conference stated April 14. May God have mercy on Apple's auto correct feature. The post was made from an iPhone, which is difficult enough, and October must have been misspelled and "corrected" to April. Much apologies. October 14 is the conference.